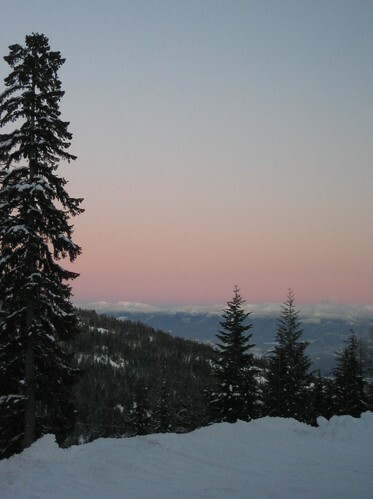 Yep, I’ve been gone, once again off to ski at Schweitzer Mountain, my home-away-from-home in northern Idaho. This time, Mr. Karen and I (along with Sock Monkey) flew out together since our truck was already out there. We got to the condo late Saturday night and skied the next six days before flying back home. One of our ski days was quite short due to Mother Nature being mean; it snowed four inches overnight, then rained, so we woke to a mountain that looked like it was covered in a soft blanket of drifted snow but which was actually iced over. Only two lifts were open that day due to the others being unsafe to load in the high winds that had kicked up, and it really wasn’t a good idea to ski on the ice crust, so we did all the groomed runs that were open and called it a day. If I were extremely Karen-centric, I’d say that all happened because the Universe wanted me to take a break; I was definitely losing some vim by that point in the week but the short day reinvigorated me. I had only one slightly dramatic fall, in which I was swooping down an empty groomed run, misjudged when to turn and ended up tumbling down the deep ungroomed stuff at the side of the trail; that got me some strained muscles and a bent pole but nothing ibuprofen and Mr. Karen couldn’t fix. The most painful thing was smashing my elbow into the center pole on one of the chairs when loading the lift; that bruise is still blooming. Those minor mishaps aside, it was a great week, with 13 inches of snow and plenty of opportunity to enjoy the beautiful mountain surroundings.